Techniques by Trish: Butterfly Reflections, Ink Sketch Challenge! Hey Everyone! 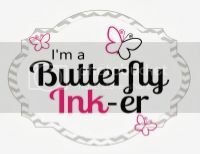 I'm excited to be taking part in the sketch challenge at Butterfly Reflections, Ink Blog today!! I decided to focus on just one paper pad for my card and just mix up different patterns and colors of paper. I absolutely loved the watercolored flower sheet and knew I just HAD to use it! I decided to cut out a few of the flowers to accent my super bold sentiment (from my new favorite stamp set). And as a final touch, I added a few enamel dots!